It's Friday and time for Friday Five! Want to play along? You can either leave your answers in the comments or leave a comment that you've posted it onto your own blog. Today's topic is things that keep you warm. So, here goes! What is your favorite blanket like? DH got me a pink snuggie from Brookstone. It is so warm and cozy and I just LOVE it. ummm, snuggie. Last night I baked Brownies to bring into daycare for the kids Valentine's Day Party. What television personality gets you most hot and bothered? Hmmm. Don't make fun ok? I've had a crush forever on Freddie Prinze Jr. Also LOOOOVVVVE Bradley Cooper! He's super hot ... and I do consider him tv as I first noticed him on Alias. When did you last burn yourself? Wednesday morning morning while making chocolate chip pumpkin pancakes. I put a little bit of chocolate chip in my mouth straight from the griddle and it was freaking HOT! What are your feelings about hot sauce? I have a serious problem when it comes to hot sauce. I've been putting it on EVERYTHING at work. Like, seriously, everything. From eggs to my chicken wrap to dipping french fries in it. I have no idea why. It's a disgusting hot mystery. We ordered big beds for the kids! Nothing exciting ... just two twin beds. The plan is to set up their rooms, split them up and move them into big kid beds for their 3rd birthday in April. I'm very excited, and sad a the same time. My bubs are growing up! So, we forgot our camera at my sister's twins Christening a few weeks back. Which means we didn't get any cute pics of the twins in their fancy outfits. Little Anthony didn't even make it to the party afterwards, because he had RSV prior, so my sister didn't want him around all those people. Here is a picture of me and Sami. 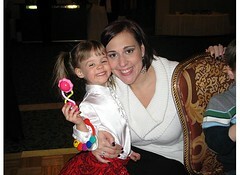 Everyone says she looks like me! 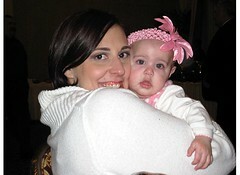 Here is a pic of me and my grown up little Miss Boots. 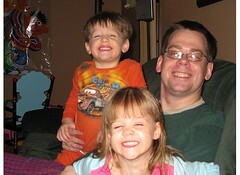 And here are my three favorite people in the whole world! oh can I have your pancake recipe that sounds so yummy! Wow big kid beds and separating them wow that is huge! Let us know how that goes. Can you kiss my nose?